The Dutch row house shown here, with an elongated (20 x 5 m) open-plan room with a high ceiling at its heart, has a very modern feel. The residents, a young couple, enjoy the freedom that the house provides. Their ideas and plans, and the way they have used the space, have been very conceptual and flexible in nature. During the first two years they lived as in a workshop, trying out many different things and changing them again in order to find the perfect result for which they were looking. They wanted to use the room for everything. It was also important to them to have a bathroom with natural light and a clear view of nature. The result is a room that brings out the generous proportions of the architecture and makes the best use of them: the actual living space is on the first floor. This is the place for cooking, eating and living. But it is also the area for relaxing, washing, showering, bathing and sleeping. Only for dressing and “wet” areas was a cube integrated. bulthaup b2 provides the perfect solution for the kitchen area. 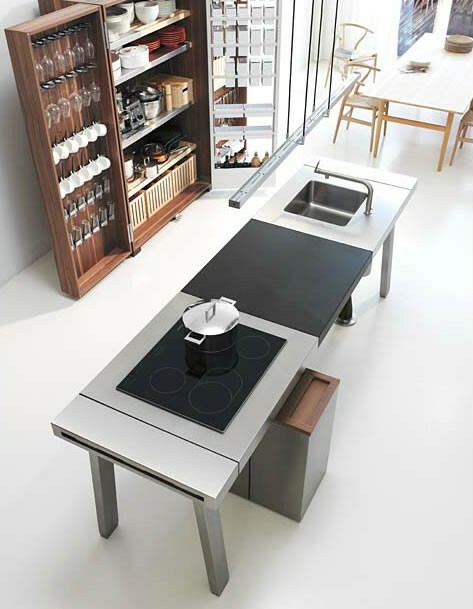 The design of the kitchen workbench perfectly meets the couple’s desire for maximum openness and orderliness. They enjoy leading an informal life style with the table as the heart and focal point, but they also like the option of hiding everything behind closed doors after the work has been done.